Integrate Pepipost with Ongage for fast email delivery! 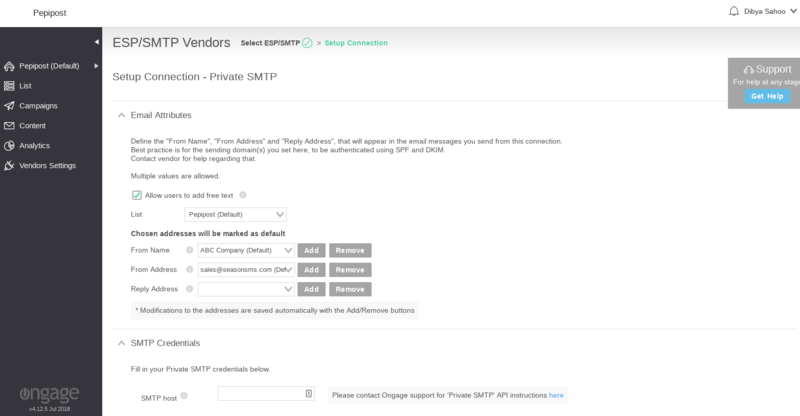 Ongage is a vendor-agnostic email marketing platform where you can use one dashboard for all operations and send emails using your favorite ESP/SMTP provider. The purpose of this document is to help you integrate Pepipost as an SMTP/email delivery channel on Ongage. 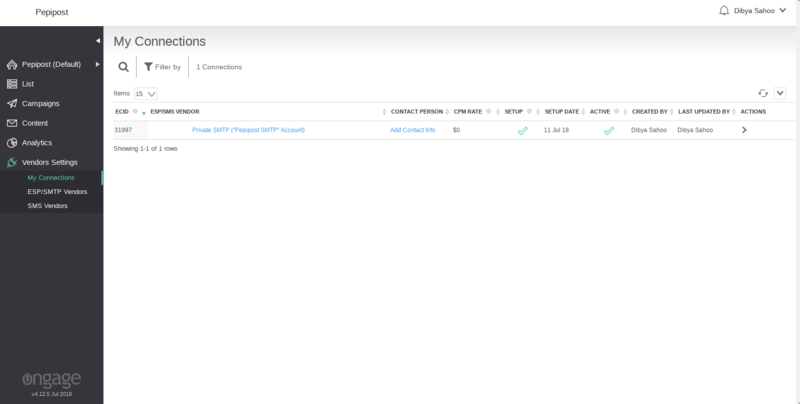 To use Pepipost as an ESP/SMTP vendor on Ongage, you must have the Private SMTP feature enabled on your account. By default, this is disabled, and you need to contact Ongage Support to enable it. The next step is to define the sender details under “Email Attributes” section. From Name: This name will be used as the name that the email will come from e.g. your company name. From Address: This address will be used as the sending address. e.g. sales@mydomain.com. Reply Address: Reply from contacts will be sent to this address. SMTP Port: You can connect via unencrypted or TLS on ports 25, 2525, and 587. Use TLS: Select “Yes”. If you are selecting this as Yes, then it is recommended to select port 587 above. Once done, click on “Verify Credentials”. During this phase, Ongage will try to make a connection to Pepipost SMTP using your details. If the connection is successful, you will see a success message. If not, you will see an error. Note: The Bounce domain i.e. bounce.mydomain.com needs to be pre-configured under the “Sending Domain” section on Pepipost. Click here to see the steps for pre-configuring a domain. If the domain is not configured and approved on Pepipost, then the email sending will fail under your Ongage account. Once the MX record pointing is completed on your DNS, click on the “SAVE” button at the bottom of the page. Now, you are ready to send any type of test or live email campaigns from your Ongage account. To enable and white label the open and click tracking domain for your emails, please ensure you have completed the domain settings. For setting up the domain, please follow the Getting Started screen on Ongage and choose the option “Setup Domain”. Alternatively, hover over “Your Name” at the top right corner and click on the “Tracking and Image Domains”. You need to have two CNAME records pointing properly to set up the Tracking and Image sub-domains respective. We hope this document is helpful when integrating Ongage and Pepipost. In case you have any questions, please feel free to reach out on our 24×7 live chat support or write to us on support@pepipost.com.